Archadeck of Columbus highlights the master plan of a present clients phased building master plan. The project is underway now and we are giving you exclusive access into this Columbus, OH dream backyard project. This ultimate Columbus, OH dream backyard is the master plan of one homeowner’s staged building project currently underway. Our last story provided insight into our phased building program. Phased or staged building begins with a master plan to your ultimate backyard which can be built in phases, or over years, to accommodate your budget and your lifestyle. Phased building allows you to feel like you have a new backyard during each stage of your backyard extension. Take a look at this master plan and and the phased plan to achieve this dream space. This particular project is the epitome of a dream backyard space. Phase one begins closest to the house with the deck and pergola. It is always a good idea to begin your master plan working outward from your home. The primary reason for starting closest to your home is to ensure less lifestyle interruption. It also ensures that all primary structures are tied into your home structurally as you build out from the initial phase. There is less room to overcome unforeseen obstacles that may arise when you begin a job working from the outside back to your home. This dream backyard begins with a stunning low maintenance deck and pergola combination. On the low-maintenance composite deck you will see a picture frame border with decorative inlays. To define the dining area on the new deck we are integrating a secondary color inlay for definition and contrast. The deck will include built-ins for added convenience such as a bench with storage underneath. Little touches like this that add convenience to your outdoor living space and will enhance your enjoyment for years to come. The skirting around the base of the deck includes the lines needed for the future pool addition underneath. Preparing the space for future development will ensure there is no reason to tear the skirting out when the conduit and plumbing are installed for the pool. The first phase also involves planning ahead for the intended landscaping design. It is important to have a design plan drawn up along with our master plan to ensure we are able to integrate the inline landscaping along with your design. Archadeck of Columbus will work in unison with your landscaper and your pool or spa installer to ensure every detail is accounted for and to facilitate each phase of your project. We also work with your electrician and plumber to get all your lines placed in advance to avoid retrofitting in the future. Laying the foundations for the additional phases of your master plan is an important part of the first phase of your project. Completing the pergola is also an important part of the initial phase. The pergola in this project attaches to the existing home and will provide shade to the deck. The pergola also adds beauty and character to the deck and rear of the home. This pergola will serve as much for function as aesthetics as part of the completed master plan. Phase two includes the addition of a backyard pool and the paver patio surround. This includes the patio area which will become part of the poolside pavilion. This phase is set to take place during this calendar year. The hardscape spaces will include two distinct rounded patio areas. One of the patios will serve as a spot for a large dining table or lounge chairs and the other rounded patio will serve as outdoor entertaining space. The patio construction will include running conduit underneath for the pool as well. Since the Conduit and lines for the pool are already ran under the deck and patio areas installing the pool will not disturb these completed areas during this, the second phase of the project. We anticipate the pool installation to run smoothly because of the prior preparations during this phase and phase one of the project. This phase is to include the covered patio next to the new pool and the execution of the homeowner’s landscape design. The covered patio is to be built using a hip roof to match the roof of the existing home. The roof will be supported by round fiberglass columns. The design also allows the interior of the pavilion an open, airy cathedral ceiling. The completed covered patio will also boast large exposed cedar beams along with a cedar tongue and groove ceiling. These features will add a rustic flair to the covered patio design. Abundant lighting and ceiling fans are included in the finished interior space. The preparations to accommodate the electrical plan for the covered patio were planned as part of our previous phases so this portion of the phase will run smooth as silk. The final phase of the master plan to this dream backyard includes an outdoor kitchen and outdoor fireplace within the covered patio completed in the previous phase. The outdoor kitchen area will give the homeowners a bar area that can also serve for additional seating and food preparation. A bar element within your outdoor kitchen allows the person preparing the food and the ones dining to share the same space instead of having separate spaces. It has always been said that the kitchen is the heart of the home and in this outdoor kitchen design the same rings true. Delivering two functions in one space enhances the whole experience. The final phase of this project will include the addition of the outdoor kitchen and fireplace within the covered patio completed in phase three of the project. The outdoor fireplace will provide a perfect spot for relaxing as well as entertaining. Nothing says relaxation quite like the crackle of a fire! Since the fireplace is under the chimney and there is an existing gas line to the chimney the homeowner plans to incorporate the gas into the chimney during the final phase of the project. Like with many of our completed phased building projects, there is usually room for additional outdoor living space in the future. These homeowners may decide at a later date to add a pergola over one of the circular paver patios, or even an area to facilitate a spa. Once their space is complete they can enjoy all the outdoor living opportunities to come. For more inspiration on creating your ultimate backyard visit our decks photo gallery and our outdoor living photo gallery located on our website. An eye catching design, quality materials and functional space make up this TimberTech deck and paver patio combination structure in Dublin, OH that we recently unveiled. Our recent project in Dublin, Ohio is full of functional space that is easy on the eyes. 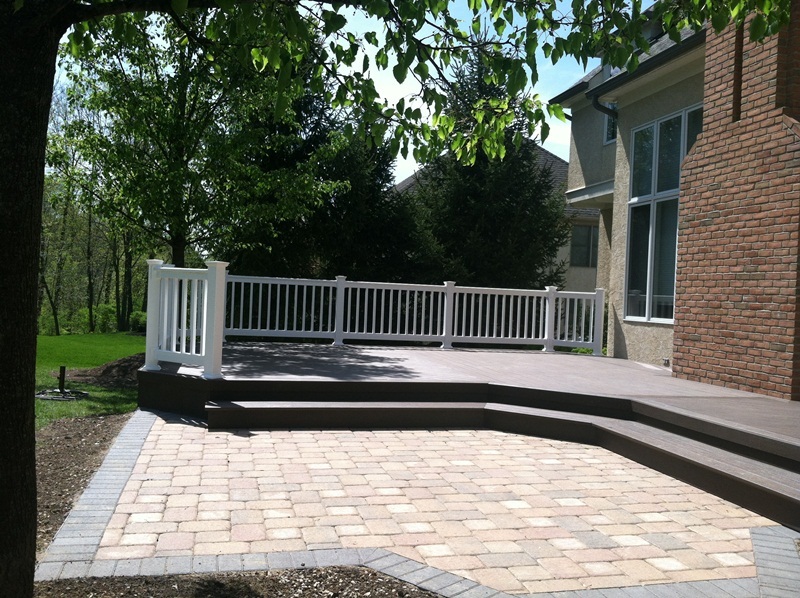 This stunning hardscape patio and TimberTech deck combination in Dublin, Ohio is proof that a functional addition to your outdoor living doesn’t have to be huge nor does it need to cost a fortune. Many times lot constrictions, setbacks and a lack of usable space create a scenario where an expansive space isn’t possible. It is possible however to create a space that is simple, effective and pretty in spite of limitations. 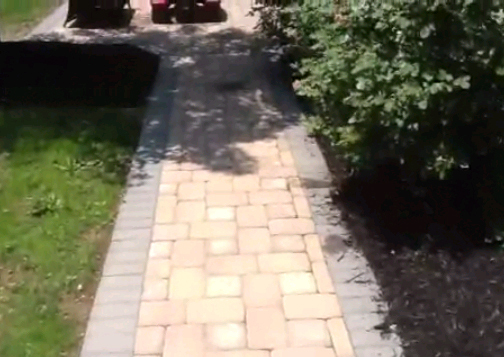 Take a look at this finished outdoor project. These homeowners wanted a space that would allow for some relief from the sun for their child, as well as an area where they could enjoy their beautiful backyard as a family. We came up with a combination structure design that provides both. The family’s new backyard space now consists of a low maintenance composite deck and paver patio, with a hardscape path that ties the two structures together an provides a way to and from the outdoor area from the side of the home. Notice how the soldier course border gives the pathway a unified, finished look. The new deck was built using TimberTech XLM in Walnut Grove. We installed the boards using a unique pattern and finished the design with a picture frame border that spans the entire outside perimeter of the deck. It adds visual interest when we are able to work in a unique pattern or design into a deck, a step beyond your normal everyday deck. The railings were done in white vinyl to compliment the windows of the home and they also help bring the rich Walnut Grove color of the deck into the spotlight. We also built a wide-angle step box which leads down to the paver patio below. On the paver patio we used Unilock Camelot pavers in Coffee Creek, this color palette leads down to the walkway and around to the driveway as well. We accented the Camelot pavers with a Holland Stone soldier course edge to add contrast. The entire area is conducive to good traffic flow which will make both areas more functional for everyday enjoyment. The homeowners are elated with the finished project and are looking forward to enjoying their new outdoor area for many years to come. Contact Archadeck of Columbus to learn more about how we can make your backyard a prime destination for relaxation, fun and family times, even with a limited budget or limited space. See more backyard combination ideas by visiting our composite and vinyl deck gallery and our patio and hardscape gallery located on our website.